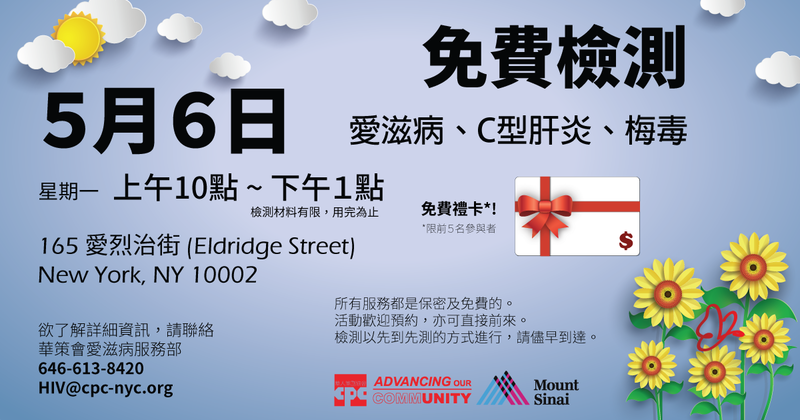 CPC Community Health Services and Mount Sinai Hospital is collaborating to provide free and confidential HIV, Syphilis, and Hepatitis C testing. Most people who are infected with HIV does not show symptoms. You can only know your status by getting tested. If you think that you are infected, you should get tested as soon as possible. Take the F, J , M, or Z train to Essex St./Delancey St.
Our twice-a-year testing event (5-8pm) will be in end of June, stay tune and check back on our FB page!